Southwest Florida’s Babcock Ranch, with sustainability designed into the entire fabric of the community, has been certified a Platinum “Florida Green” community by the Florida Green Building Coalition (FGBC). Developer Syd Kitson of Kitson & Partners was recognized during FGBC’s annual meeting on Nov. 15 in Orlando. Kitson has been planning Babcock Ranch for more than a decade. 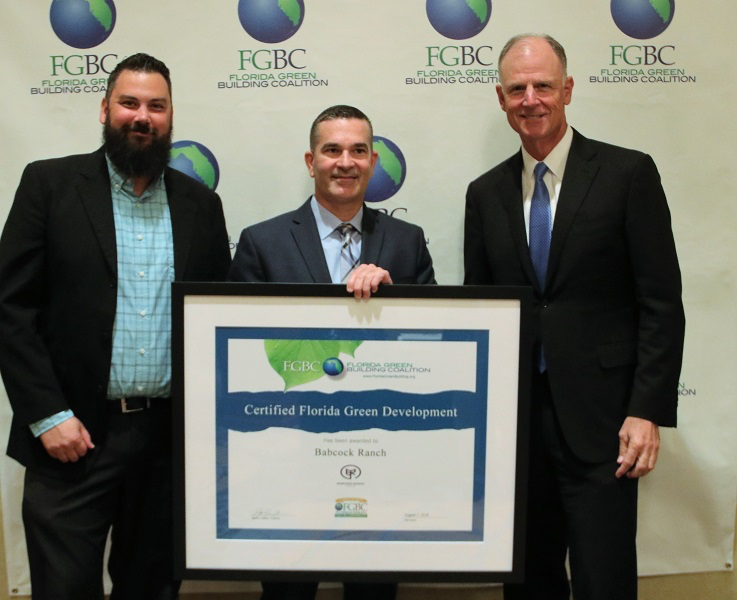 FGBC says in a statement that, unlike other certification programs, its standards are the only ones developed with Florida-specific criteria that addresses the state’s hot-humid climate, environment, topography and natural disasters. Scoring 151 points, Babcock Ranch achieved Platinum, the highest certification level. Babcock Ranch’s FGBC Green Team included architect Scott Merrill, Merrill Pastor & Colgan Architects, Vero Beach; FGBC Designated Professional Jennifer Languell, Trifecta Construction Solutions, Fort Myers; land planner William Waddill, Kimley-Horn and Associates, Inc., Port Charlotte, and FGBC evaluator Chris Wrenn.